A frozen “super-Earth” has been discovered orbiting Barnard’s Star, the closest single star to the Sun. Despite temperatures of -150 degrees C, scientists believe there could be pockets of liquid water beneath the i8ce capable of harbouring life. Barnard’s Star is six light years from Earth and three times bigger. (p. 2). Barnard’s Star is a red dwarf, a small, cool star smaller than the Sun. As a result, the ‘goldilocks’ zone around it, in which the temperatures are right for organic life as we know it, is also smaller and closer to the star. Way back in the 1960s one astronomer also believed he had detected two planets, about the size of Jupiter or bigger, orbiting it, but his findings were not confirmed by other astronomers. Nevertheless, Barnard’s Star was selected as the destination for an interstellar mission by the BIS in the 1970s. Their Project Daedalus was the design for a two-stage, robotic starship using Helium-3 as fuel, mined from the atmosphere of Jupiter. They considered that the ship would be built in the 15th century, and would be able to make the trip in 50 years. This would mean that scientists, who started work on the programme in their twenties would still be alive when the ship finally reached its destination. In the realm of Science Fiction, the Russian SF author Valentina Zhuravlyova chose it as the setting for her story, ‘The Astronaut’. This is the tale of Captain Alexei Zarubin, the captain of a doomed mission to a planet orbiting the star. In order to combat the terrible boredom experienced by space crews during long, largely automated voyages, each crewmember is required to have a hobby. Zarubin’s is painting. There’s an accident, so that the ship is unable to return to Earth unless one of them stays behind. Zarubin volunteers. Years later, another mission arrives at the Star in order to investigate what happened to him. They don’t find him, but he has left behind his paintings, showing the red-lit frozen wastes of the planet on which he was marooned. The story was included in the anthology Science Fiction Stories (London: Octopus Books 1979), Tom Boardman Jr., ed., pp. 267-84. Of course, to fans of The Hitch-Hiker’s Guide to the Galaxy, Barnard’s Star is where the Galactic Hyperspace Development Council but the plans for the construction of a new hyperspace bypass going through the solar system, which would require the demolition of Earth. Just like the terrestrial council put the plans for the demolition of Arthur Dent’s house in a locked filing cabinet in a disused basement marked ‘Beware of the Leopard’. While future centuries may see the construction of real spaceships heading to Barnard’s Star and its world, fortunately there seems very little likelihood of the Vogon Constructor Fleets appearing in our skies to demolish our world. This is absolutely incredible. It really is like something from dystopian Science Fiction, but unfortunately it’s true. In this clip from the Jimmy Dore Show, the American comedian and his co-hosts, Ron Placone and Steffi Zamorano comment on a report from Democracy Now! that Trump has decide to appoint Jim Bridenstine as the new head of NASA. Bridenstine has no scientific credentials, and doesn’t believe in climate change. In fact, in 2013 he stood on the floor of the senate and demanded that Barak Obama apologise for promoting it. The trio begin the clip by remarking on the evidence from the hurricanes to hit America that climate change is real. Before storm Harvey, only three magnitude 5 storms had hit America. They then show how ludicrous the decision is by stating that as Trump has appointed someone, who doesn’t believe in a scientific fact to head a scientific agency, then Richard Dawkins should be appointed to head the national prayer breakfast. Dore jokes that there hasn’t been a government this anti-science since Galileo. And the Pope has apologized for him. The papacy also acknowledges climate change. Which means the world’s most religious Roman Catholic is more progressive than Trump and his minions. There’s no way this is anything other than an attempt by the Republicans and their paymasters, the Koch brothers, and the other big polluting industries, to hobble and silence research into climate change in America. One of the functions satellites carry out is weather and climate monitoring. Space research generally has also led to greater understanding of weather systems on Earth. For example, the massive storms that rage across Jupiter are driven by the same laws and forces as those, which generate similar storm systems on Earth. Countries like India have invested in their space industry for the promise it offers of monitoring the weather and the progress of crop diseases, which can be disastrous for a developing nation, much of whose population are subsistence farmers. Dore’s wrong about the Pope’s treatment of Galileo, however. Yes, it was scandalous, but at the time Galileo’s own research was actually undersupported. And he didn’t help himself in his book, the Dialogue of the Two World Systems. He knew the pope was an Aristotelian, but deliberately made the Aristotelian speaker in the book appear as stupid as possible. Even so, the Church was not uniformly against him. He did have supporters within the church and amongst the cardinals. See James Hannan’s God’s Philosophers: Science in the Middle Ages. But this is like something from Science Fiction. Stephen Baxter’s Titan is an alternative history, in which a rabidly anti-science senator becomes president of the US and closes down NASA. It’s because he’s a Creationist, and doesn’t believe in the Copernican heliocentric system, or the discoveries revealed by Galileo. What isn’t shut down, is given to the USAF and given over to defence instead, while the agency’s museum is shut, except for its museum. This is then altered to stress the religious experiences many of the astronauts had when exploring space. This isn’t quite fair on the Creationists. Those I knew did not reject Galileo and they didn’t reject heliocentrism, although I’ve since come across people, who do on the Net. But there are still clear parallels between Baxter’s book and Trump and those who back him. Yesterday I found an interview with the veteran comics creator, Pat Mills on YouTube. I’m going to have to write a piece about it, because Mills is very left-wing and a fierce critic of capitalism and Britain’s class system. In the video, he states that when he started writing for 2000 AD, he and the others were told to create futures, which people would live in. And now we are. He pointed out that there really were robots, which looked like Robusters, and we also now had Donald Trump, who was very much like something from 2000 AD’s often bleak view of the future. And he’s right. Trump’s appointment of a scientific ignoramus like Bridenstine is almost exactly like something from Science Fiction. And Mills compared Trump himself to Judge Cal, the deranged Chief Judge of Mega City 1, who behaved like Caligula. He appointed his pet fish as judge, and had one of the other judges pickled. Oh yes, and he called in the alien Kleggs to keep the human population of Mega City 1 under control. Trump hasn’t made contact with an evil alien life forms yet, but the nepotism and corruption is all there. Even if he hasn’t made his goldfish senator. But given the fictional parallel drawn by Mills, Bannon, Kelly-Anne Conway and the others he’s got rid of should be glad he just had them sacked. The real trouble’s going to start when he starts ordering human-sized pickled jars. Looking through YouTube, I found that someone had made an animated video about the spacecraft depicted in Steward Cowley’s Spacecraft: 2000 to 2100 (London: Hamlyn 1978). The book’s supposed to be a handbook of 21st century spacecraft, published by the Terran Trade Authority. 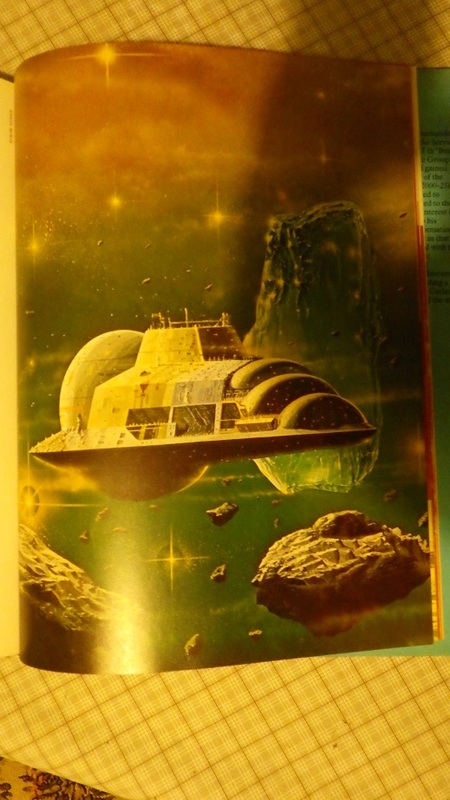 In fact, it’s a collection of illustrations from SF book covers by the great space artists Angus McKie, Bob Layzell, Tony Roberts and others, which Cowley then described as real spacecraft. These were part of a ‘future history’ of human space exploration and colonisation which included humans travelling to encounter intelligent alien civilisations on Proxima and Alpha Centauri, and fighting a war with the Proximans. 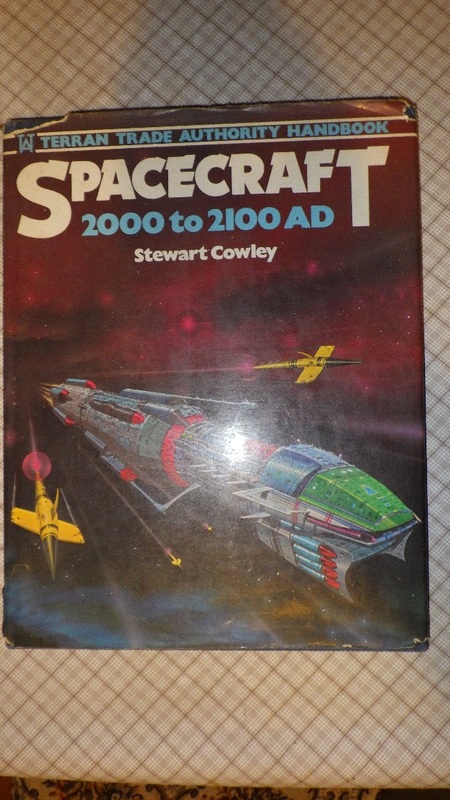 As well as Spacecraft 2000-2100, Cowley also wrote Great Space Battles, the Tourist’s Guide to Transylvania, based on Horror book covers, and Home Brain Surgery and Other Household Skills. The artwork is stunningly beautiful. Here are a few examples. 1987 – Introduction of nuclear powered engines: ion and plasma systems. 1990 – Foundation of the World Community Research Council. 1998 – WCRC North African Space Research Centres now operational. 1999 – World Trade Authority formed to co-ordinate international commerce. 2004 – The first spacefreighter, Colonial I, enters service. 2005 – Work starts on Lunar Station. 2011 – Lunar Station operational. 2012 – Work starts on Mars Station. 2014 – Introduction of the McKinley Ion Ultradrive in Colonial II. 2015 – Martian Queen makes first commercial passenger flight to Mars. 2018 – First shipment of new alloys from Lunar industry. 2027 – Warp0 Generator perfected by Henri devas. 2036 – Manned survey ship makes contact with Alpha Centaurians. 2038 – Language barrier broken. 2039 – Trade & Technology Exchange Agreement signed with Alpha. – World Trade Authority becomes Terran Trade Authority. 2041 – First orbital industrial centre off Jupiter completed. 2042 – First Energy Absorbent Defence Shield (EADS) produced by the TTA. 2045 – Dr Hans Berger introduces the Gravity-Resist Generator. 2046 – Mars Shipyards completed. 2047 – Pathfinder IX Survey Ship destroyed by Proxima Centauri. 2048 – Interstellar Queen destroyed by Proxima Centauri. 2049 – Terran Defence Authority formed. 2052 – Battle for Mars. 2060 – Invasion of Proxima Centauri. 2068 – Peace Treaty negotiated. 2073 – First jet tube opened on Earth, between Europe and America. 2078 – First settler ship leaves for Arcturus. 2090 – Second settler ship. 2096 – Starblade introduced as first Alpha spaceliner. This is fascinating, as Star Trek’s Mr Spock would put it. Scientists at NASA have found organic molecules on the surface of the asteroid, Ceres. They can’t tell at the moment what these molecules are, but they believe they’re similar to Kerisite, and came from within the planetoid, rather than being carried to it by a comet striking its surface. This short video from D News discusses the recent finding, pointing out that this provides further evidence to support the possibility that life exists elsewhere in the universe. Ceres is the largest of the asteroids, or minor planets, orbiting the Sun between Mars and Jupiter. Most of them are quite small, and have been rightly dubbed ‘flying mountains’. Ceres, however is about 500 miles in diameter. There has been evidence before that the organic molecules forming the building blocks of life exist in the asteroid belt. These chemicals have been found in meteorites that have landed on Earth. However, with some of these the evidence has been extremely debatable. One of these meteors came down in Orgueoil in France. However, the organic molecules they found may have had a far more mundane origin, as the person, who’d discovered it had stored it in his fridge. I think it had got covered in butter, amongst other things. I found another video on this discovery, which suggested that there may also be an internal ocean on Ceres, and that the organic molecules on its surface may indicate that it has life, even of only a very primitive kind, underneath in its oceans. This would be, in the words of Zaphod Beeblebrox, ‘amazingly amazing!’ if true. I suspect there isn’t such an ocean and no life there either, but we won’t know for sure until this is investigated further. 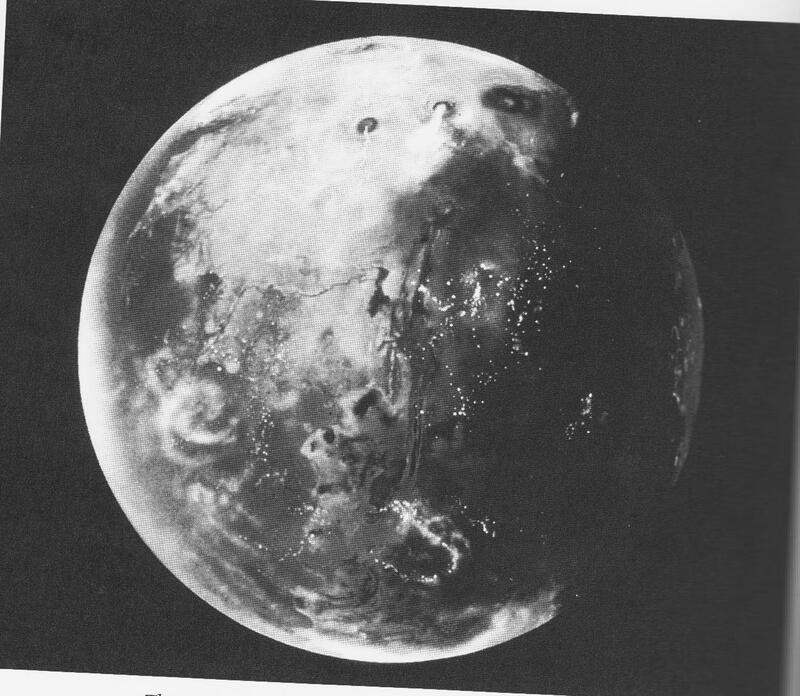 Over the past few days, I’ve been discussing on this blog the possible terraforming of Mars. Way back in the 1990s, the late Arthur C. Clarke published a book of pictures he’d generated on his computer of what Mars would look like during and after the centuries-long process. I’m afraid I cleaned that out years ago. 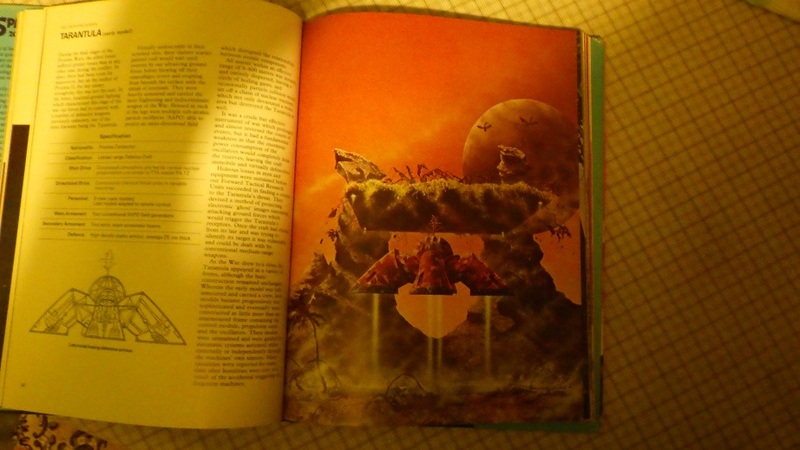 I have, however, managed to find two pictures of a partly terraformed Mars by the artist Michael Carroll, in The Case for Mars: The Plan to Settle the Red Planet and Why We Must, by Robert Zubrin and Richard Wagner (London: Simon and Schuster 1996). The first shows a group of explorers making their way along a defile or gully. The second shows a view of the planet from space. Liquid water once coursed over the face of Mars and, given the technological capability of the twenty-first century, it may once again. Several decades of terraforming could transform Mars into a relatively warm and slightly moist planet suitable some day for explorers without space-suits, although breathing gear would still be required. Returning oceans to Mars is actually a possibility for the distant future. I think Kim Stanley Robinson explored a Mars, which after centuries of terraforming now possessed oceans, in two of his trilogy of books on the Red Planet, Blue Mars and Green Mars. There are also a series of videos on YouTube by someone, who has used the astronomy programme Celesta, to simulate the terraformation of Venus, the Moon, Mars and Titan. As for Titan, Stephen Baxter’s SF book of the same name concludes with two astronauts, sent on a mission to Jupiter’s moon, waking up billions of years in the future. The Sun has expanded into a Red giant, supplying this currently icy world with the heat necessary for an Earthlike environment. By this time, however, humanity is extinct and the moon’s current occupants are a race of alien explorers. China has laid out plans to become the first country to soft land a probe on the far side of the Moon, by around 2018, and launch its first Mars probe by 2020. “To explore the vast cosmos, develop the space industry and build china into a space power is a dream we pursue unremittingly,” read a White Paper released yesterday listing the country’s space strategy for the next five years. It says China aims to use space for peaceful purposes and to guarantee national security, and to carry out cutting-edge scientific research. The document points to the growing ambitions of China’s already rapidly advancing space programme. China places great emphasis on the development of its space industry, seen as a symbol of national prestige that will raise the country’s standing in the world. Although the White Paper does not mention it, China’s eventual goal is to land an astronaut on the Moon. While Russia and the United States have more experience in manned space travel, China’s military-backed programme has made steady progress in a comparatively short time. There is also an inset panel providing a little snippet of further information. Since China conducted its first crewed space mission in 2003, it has staged a spacewalk and landed a rover on the Moon in 2013 – the first time humans soft landed anything on the Moon since the 1970s. (p,. 22). I say good luck to them. The Apollo moon lands are now nearly 50 years in the past, and I really believe that it’s high time we sent people back out into space to explore the planets. And some western space scientists and writers have been predicting for well over a decade now that China might just be the nation to do it. 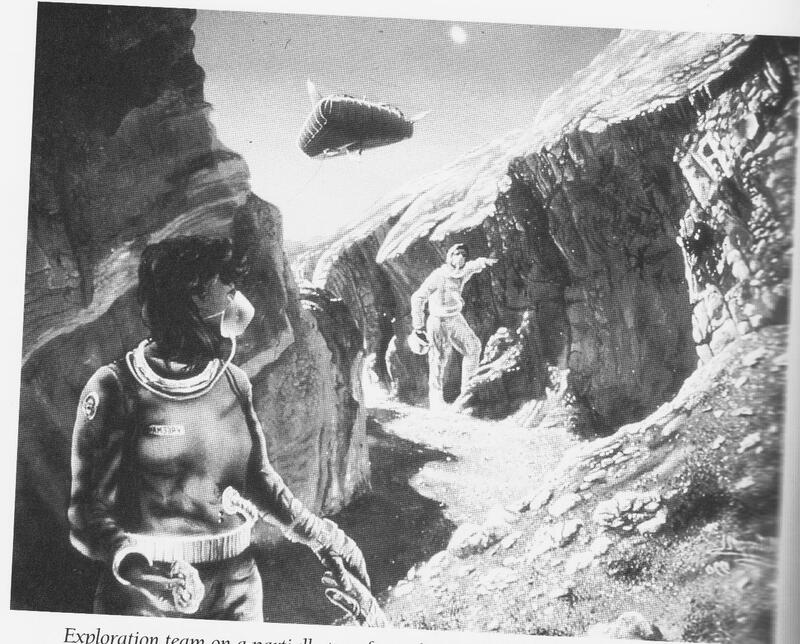 The quantum physicist and SF writer, Stephen Baxter, wrote a piece in Focus magazine speculating that the Chinese may be the first nation to send a person to Mars in the next decade or so, and wrote a fictional scenario in which the first person to step out onto the Martian surface is a female taikonaut from the Middle Kingdom. The SF author, Paul McAuley, wrote a novel, Red Dust, set on a future, Chinese dominated Mars with an ecosystem created through genetic engineering, to tailor creatures specially adapted for conditions on the Red Planet. nd a decade or so before then, 2000 AD in its future war strip, The V.C.s, also portrayed a Mars settled by the Chinese. I wish the Chinese every success in their peaceful exploration of the Solar System, and hope that this will encourage the other developed nations to expand their space programmes. The Chinese space programme will be a challenge to the American space programme, but the potential benefits of space travel, exploration and colonisation are far too important to be monopolised by any one nation. I found this really interesting, optimistic passage below in John S. Lewis’ Mining the Sky (Reading, Massachusetts: Addison-Wesley 1997). John S. Lewis is the Professor of Planetary Sciences and Codirector of the Space Engineering Research Center at the University of Arizona-Tucson. Subtitled, Untold Riches from the Asteroids, Comets and Planets, the book discusses the ways the immense mineral wealth of the solar system and the access it gives to the energy available from the Sun through solar power can be exploited through the colonisation of the solar system with present-day space technology, or developments from it that can reasonably be expected. The chapter ‘The Asteroid Belt: Treasure Beyond Measure’ describes the vast resources of the tiny, rocky worldlets of that part of the solar system, situated between the orbits of Mars and Jupiter. Not only does he describe the various metals and other minerals available there, but he also discusses the vast increase in personal wealth that would be given to nearly everyone on Earth if the money gained from the mining of these minerals were shared out equally. I do not want to leave the impression that enough mineral wealth exists in the asteroid belt to provide $7 billion for each person on Earth. That would not be fair. In fact, this estimate completely ignores the value of all th other ingredients of asteroids besides iron. We know, for example, that for every ton of iron in the asteroids, there’s 140 pounds of nickel. That comes to about $6 billion worth of nickel. Meteorite metals contain about 0.5 percent cobalt, which sells for about $15 a pound. That gives another $26 billion each. The platinum-group metals, which sell for about $460 per troy ounce ($15 per gram, or $6,800 per ound) make up about fifteen parts per million of meteorite metal. That comes to another $1.6 X 10 X 20, which is $32 billion per person. So far that is about $72 billion each, and we are not close to done. Add in gold, silver, copper, manganese, titanium, the rare earths, uranium, and so on, and the total rises to over $100 billion for each person on Earth. It appears that sharing the belt’s wealth among five billion people leads to a shameless level of affluence. Each citizen, assuming he or she could be persuaded to work a forty-hour week, could spend every working hour for 70 years counting $100 bills at the rate of one per second (that’s $360,000 per hour) and fail to finish counting this share of the take. If we were instead to be satisfied with an average per capita wealth comparable to that in the upper economic classes of the industrialised nations today, roughly $100,000 per person, then the resources of the belt would suffice to sustain a million times as many people on Earth. These 10 to the power of 16 people could all live as well as ninety-fifth percentile American of the late twentieth century. With recycling and an adequate source of power, this immense population is sustainable into the indefinite future. The best use of the wealth of the asteroid belt is not to generate insane levels of personal wealth for the charter members; the best use is to expand our supply of the most precious resource of all-human beings. People embody intelligence, by for the most precious resource in the universe and one in terribly short supply. (p. 196). Now clearly, this is the ideal situation, presented without the risks and costs of actually reaching the asteroid belt and extracting the wealth bound up in its rocks. I also believe that in practice, much of that wealth would also be consumed by the mining companies or terrestrial government agencies responsible for the belt’s commercial exploitation. But it is refreshing to see humans viewed not as a cost in the process of production, which needs to be eliminated as much as possible, but as a valuable and indispensable resource, which needs to be used in the process of exploration and commercial exploitation as much as possible, and handsomely rewarded for its contribution. On the next page, Lewis also describes the advantages of solar power for the future miners and colonists over fossil fuels and nuclear fission. But wait a minute! Why not use solar power? The Sun pumps out power at the prodigious rate of 4 X 10 to the power of 33 ergs per second, equivalent to 4 X 10 to the power of 26 watts. Our supercivilisation needs 10 to the power of 19 watts to keep going. The Sun is pumping out forty million times as much power as we need! But what do we need to do to capture and use that energy? The simplest answer (not necessarily the best-there may be even more desirable options that we have not thought of yet) is to use vast arrays of solar cells to convert sunlight into electrical power. If the cells have an efficiency of about 20 percent, similar to the best commercial cells made at present, then each square meter of cell area exposed to the Sun near Earth’s orbit would generate 270 watts of electrical power continuously. We would need thirty-seven billion square kilometers of solar cells to provide our power needs, an area comparable to the total surface area of our habitats. At about 0.1 grams per square centimeter for the solar cells, we would need about 3.7 X 10 to the power of 19 grams of silicon to make the cells and perhaps three times as much metal to provide the supports and wires for the power-collection system. The asteroids give us 4X10 to the power of 23 grams of silicon, more than ten thousand times the amount we need for this purpose. The cost of the solar power units is set by the need to construct a few square meters of solar cells per person. The cost would be about two hundred dollars per person at present prices, or a few dollars per person at future mass-production prices. That is not your monthly electric bill: it is a one-time-only expenditure to provide all the electric power you will need for the rest of your life. All this reckons with 1997 technology. New types of high-efficiency solar cells made of gallium arsenide or other exotic materials, combined with ultra-lightweight parabolic reflectors to collect and concentrate sunlight onto small areas of these cells, promise to perform much better than these highly conservative estimates. (pp. 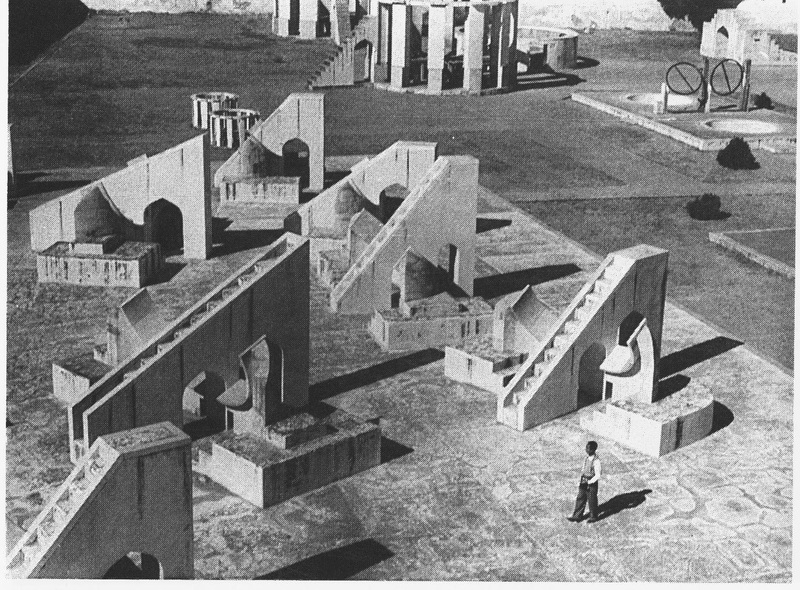 197-8). This is the solar power available for the asteroid colonies near Earth. In a later chapter, 14, Lewis discusses ‘Environmental Solutions for Earth’. Lewis certainly isn’t against private industry in space. Indeed, in an imaginary scenario in one of the first chapters he has a future businessman enthusing about the profits to be gained from mining the Moon or other parts of the Solar system. But he’s clearly like many space visionaries in that he believes that humanity’s expansion into the cosmos will bring immense benefits in enriching and raising the personal quality of life for each individual as well as benefiting the environment down here on Earth. But reading that paragraph on the benefits of solar power does show why some politicians, particularly in the Tory and Republican parties in Britain and America, who are the paid servants of the nuclear and fossil fuel companies, are so dead set against solar power, as well as other renewables. Quite simply, if it’s adopted, these industries immediately become obsolete, the obscene wealth enjoyed by their CEOs, senior management, and the aristocracy of Middle Eastern oil states, like Saudi Arabia, vanishes along with their political power. And the proles have access to cheaper power. Indeed, people using solar power today are actually able to reverse the usual norm slightly and sell power back to the grid. No wonder the Tories are trying to shut it all down in favour of nuclear and fracking. The Christmas season is definitely upon us, so I thought I’d post something seasonal. Patrick Moore was sceptical of some of the explanations offered for the Star of Bethlehem, which led the Magi to the infant Jesus. In the 1983 edition of the Yearbook of Astronomy, he dismisses the idea that it could have been an particularly bright appearance of Venus, noting that the planet was far too well known to appear new. He also noted that no new stars were recorded in the astronomical records of the time. If we regard the periods [time taken for planet to complete one rotation around the Sun – Beastrabban] as 12 and 30 years approximately, we see that Jupiter covers about 30 degrees a year, while Saturn moves through 12 degrees. Thus, Jupiter gainis 18 degrees a year on Saturn, and conjunction of the two planets can only occur at an interval of 20 years. If both planets travelled in circular orbits it can be shown that only one in six of these conjunctions could possibly be triple, and we should then expect to have a triple conjunction every 120 years. However, both of these giant planets have accentric orbits, and both are subject to severe perturbations, so tyhat this average is never realized. the last three tiple conjunctions of Jupiter and Saturn occurred in 1452, 1683 and 1940, and the intervals here are more than double the 120 years. In all of these cases, the time between the two oppositions was of the order of a day or less. One tripole conjunction of Jupiter and Saturn has received a great deal of attnetion. This is the conjunction of BC7 which, it was suggested, could be the explanation for the Star of Bethlehem. This old idea had been rejected in many quaarters because the two planets were well separated in latitude and were, in any case, familiar objects to the Magi. In recent times the subject has been revived, but now the astrological significance of the even has been emphasized. This seems a more reasonable suggestion, though it does not explain all the details of the story. Certainly the rarity of this triple conjunction (which the Magi would never have witnessed before) would give added significance to the event. (p. 83).